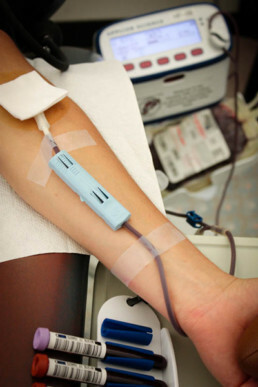 (Standard blood donation) During this donation process, about a pint of blood is collected from the donor. It is then sent to the lab where it undergoes extensive testing, is separated into components and prepared for distribution to one of the hospitals we serve. Whole blood donors can donate every eight weeks at any one of our three donor centers or at one of our numerous community blood drives. The entire process normally takes 40 to 50 minutes to complete. Red blood cells are the most abundant cells in the blood. They are shaped like a donut but with a flat, intact center and are flexible as they pass through blood vessels. They are produced in the bone marrow from stem cells, their production being controlled by a hormone called erythropoietin or EPO. A protein molecule called hemoglobin is attached to red blood cells and is what gives them their red color. It is also this molecule that carries oxygen to the tissues and returns carbon dioxide from the tissues back to the lungs for removal. Red cells have a life span of about 120 days. Following a donation of whole blood or red cells it takes approximately 6 weeks for the body to replace those lost cells necessitating a wait of 56 days between whole blood or red cell donations. The volume of a whole blood donation is a minimum of 472mL or a maximum of 538mL (about 16 to 18 ounces or one pint) depending on the weight of the donor. 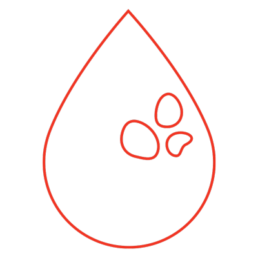 When giving red blood cells via the Apheresis or Automated process, a donation of one unit is 250mL of red cells only (no plasma). Donors with higher blood volume (higher height and weight) are able to donate a “double red” or twice the red cells (500mL) which requires a wait of 112 days before their next donation. Red cell levels are determined by a hematocrit or hemoglobin lab test. 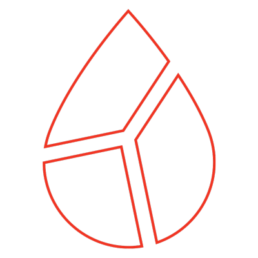 Hematocrit measures the percentage of red blood cells in the total volume of blood. Normal levels are 40-54% for men and 36-48% for women. Hemoglobin measures the hemoglobin protein level (normal Hgb for men is 14-18 grams/deciliter or 12-16 g/dL for women). Dehydration can cause hemoglobin/hematocrit to be higher than normal and conversely being overhydrated can falsely lower these levels. When you have too many red blood cells it is called erythrocytosis and is often seen in patients with cyanotic heart disease. Polycythemia is also a blood condition in which there are too many red blood cells but can be accompanied by an increase in white blood cells and/or platelets. A high red cell count increases the thickness of blood and can block the microvasculature of the lungs and kidneys. Most of the signs and symptoms of erythrocytosis are due to this higher viscosity and can include headaches, shortness of breath, dizziness, nosebleeds, blurred vision, and weakness and, if extreme, may lead to heart attack or stroke. Having too few red blood cells or red cells that do not function properly is called anemia. Anemia can be serious because there are not enough red cells to transport sufficient oxygen to the tissues. Other body systems try to compensate to make up for this loss such as an increased heart rate and respirations to take in more oxygen. Anemia is frequently seen in patients with cancer being treated with chemotherapy and radiation as well as in end-stage renal disease. Signs and symptoms of anemia include weakness, fatigue, pale skin, irregular heartbeats, shortness of breath, dizziness/lightheadedness, chest pain, cold hands or feet and headaches. Plasma is the liquid portion of the blood and the means through which the formed blood elements- red blood cells, white blood cells, and platelets – circulate throughout the body. Plasma can be collected from either whole blood (by dividing whole blood into red cells and plasma) or by apheresis – the process of withdrawing whole blood, spinning it in a centrifuge and separating it into component parts; red cells, plasma and platelets. A single unit of plasma is roughly 200-300mL. 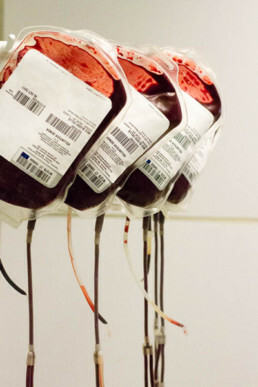 Up to four units of plasma can be obtained when using apheresis because donors receive replacement fluids during the procedure so as not to deplete their circulatory volume. Transfused plasma is used for massive blood loss, for wound healing and burn patients, bleeding disorders, clotting factor deficiencies, congenital deficiencies and during therapeutic plasma exchange. 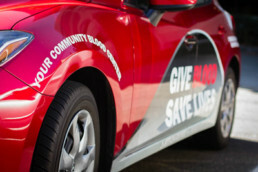 Plasma takes about three weeks for your body to replenish and can be donated every 28 days. 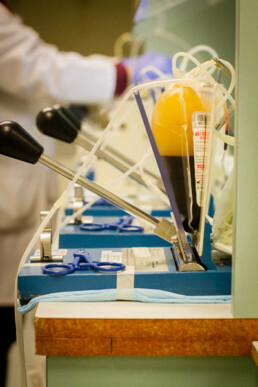 Normal healthy plasma, once separated from red cells, is straw yellow in color. The color can vary somewhat depending on hydration level, medications (e.g. oral birth control can make plasma slightly green) or the presence of lipids or fat (plasma can look milky depending on the amount of fat). A normal amount of plasma is considered to be about 55 to 60% of a person’s total blood volume. Since a person’s blood volume is fairly constant (depending on gender, height and weight), plasma volume is therefore dependent upon the concentration of red cells; the higher the red cells the lower the plasma volume and conversely, the lower the red cells, the higher the plasma volume. Plasma is mostly water, approximately 90%, while the other 10% is made up of plasma proteins, (e.g. albumin, globulins, fibrinogen), small nutrients (e.g. glucose, lipids, amino acids), gases (oxygen, carbon dioxide, nitrogen), metabolic waste products (urea, lactic acid), electrolytes (sodium, potassium, calcium, chloride), vitamins and hormones. Plasma proteins help maintain blood volume in the vascular space as well as helping to regulate the pH level of the blood. Electrolytes (i.e. sodium, potassium, chlorine and calcium) are critical in maintaining fluid balance, nerve conduction, muscle contraction and blood clotting. Plasma also contains glucose (sugar) which provides the body with its’ necessary energy. Platelets are a critical component of your body’s clotting cascade and the first line defense in stopping blood loss once a blood vessel is injured. When such an injury occurs, platelets are triggered to change from their inactive ‘plate’ shape into their active shapeless form with long tentacle-like arms. These arms connect to other platelet arms as well as adhere to the walls of the blood vessel weaving an initial clot over the break in the vessel wall. When you donate platelets, they are suspended in plasma and will make the plasma look iridescent, shimmery, or ‘swirly’. A single unit of platelets is approximately 4.0 x 1011 platelets or 400 billion platelets in about 250mL of plasma. Those donors who have platelet counts in the higher-than-normal range can give up to three units of platelets in a single donation. Platelet counts return to normal levels about three days after donation, therefore platelets can be donated every seven days but are limited to 24 donations a year. A normal count for a healthy adult is 150-450 platelets per microliter of blood. They are produced in the bone marrow and are the smallest and lightest of all the blood cells. Roughly 70% of platelets continuously circulate in your blood stream while 30% are stored in the spleen. They have a 7-10 day life span and are regenerated at about 200 billion new platelets per day. Platelets are transfused to treat low platelet counts associated with chemotherapy and leukemia, blood loss during major surgery or traumas and for platelet function defects. The medical term for a low platelet count is thrombocytopenia (throm-bow-sigh-toe-peen’-ee-ah). This can be due to either decreased platelet production by the bone marrow or increased platelet destruction. Certain medications, some types of cancers, kidney infection/ dysfunction and excess alcohol consumption can cause a low platelet level. Symptoms include bruising, prolonged bleeding from cuts and frequent bleeding from gums, nose or GI tract. A higher than normal platelet count is called thrombocytosis (throm-bow-sigh-toe’-sis). When the bone marrow produces too many platelets without a known cause it is known as essential or primary thrombocytosis. High platelet counts due to a medical condition/ medication is called reactive or secondary thrombocytosis. Regardless of its cause, too many platelets can lead to a higher risk of blood clotting. Symptoms of thrombocytosis can include headache/dizziness/lightheadedness, chest pain, weakness, vision changes and numbness of hands/feet. After your unit of blood is collected – along with sample tubes for testing – your blood donation is transported to our component laboratory. 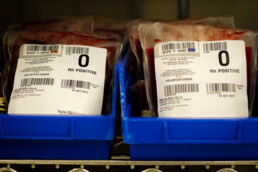 Whole blood donations are spun or centrifuged to separate the red cells from the plasma. Red cells are filtered to remove leukocytes (white cells) and then the red cells and plasma are divided into separate units for transfusion. Verification of your blood type and your positive or negative Rh factor. 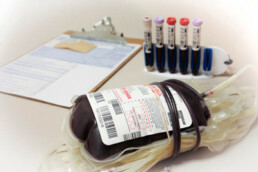 No blood is released for transfusion without passing the required tests. Although it is rare to find donated blood that may transmit infection, those units of blood that are reactive for viral markers are not released for transfusion and the person who made the donation is notified. After your blood has been divided, passed all tests, and been properly typed and labeled, it is stored in large refrigerators and freezers at CRBS. It is now ready for distribution to hospitals. 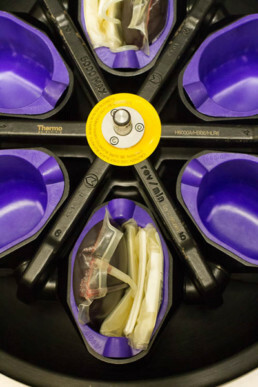 The blood components are carefully packed in special temperature-controlled containers and then transported to our partner hospitals. 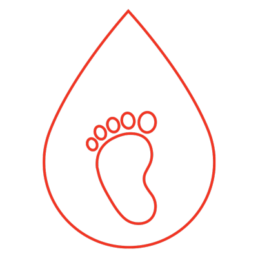 The final step in your donated blood’s journey is when the right type of donation you have made reaches the right patient-typically within 10 days.